ocean aware I can tell the aloha here is strong. I spend a lot of time facetiming a cute kid in California because I so very much want him to BE HERE with me. The site has sea turtle feedings, stingray shows and the coolest thing? This 750,000 open ocean aquarium with 20 sharks, huge rays and reef fish. I walk through this tube and they swim over me, lapping the current peacefully. I know I was annoying people talking in an excited voice while moving my camera slowly so Cash could see. I’m sorry. I really couldn’t help myself. This is the lesson I learned- take the kids. It is great to see, but they will probably wee a little with excitement. Take extra clothes. It is that exciting. 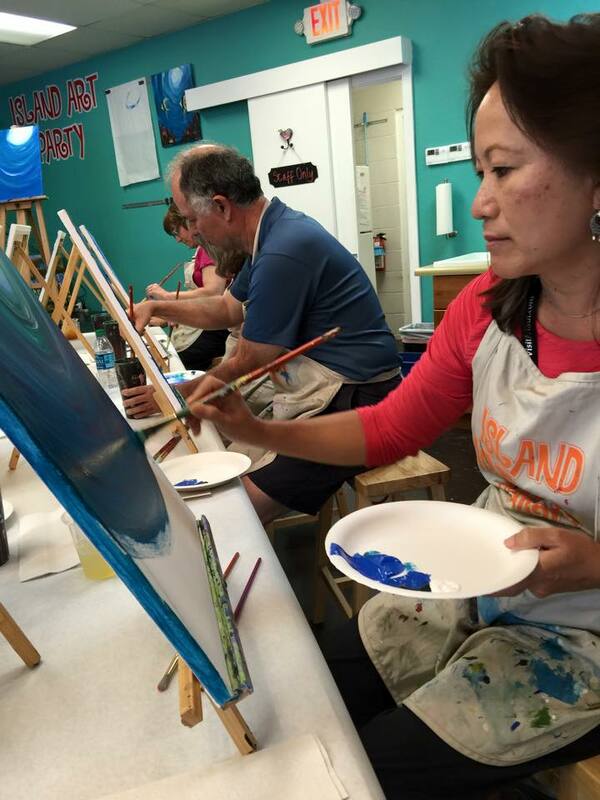 Ken and Wendy Kimi create masterpieces at Island Art Party, Kihei! These are my little fish. I am not an artist. not exactly proud of the painting, but impressed by my ability to try to go along with it. Plus they served us an amazing lunch while dancing the hula for us. 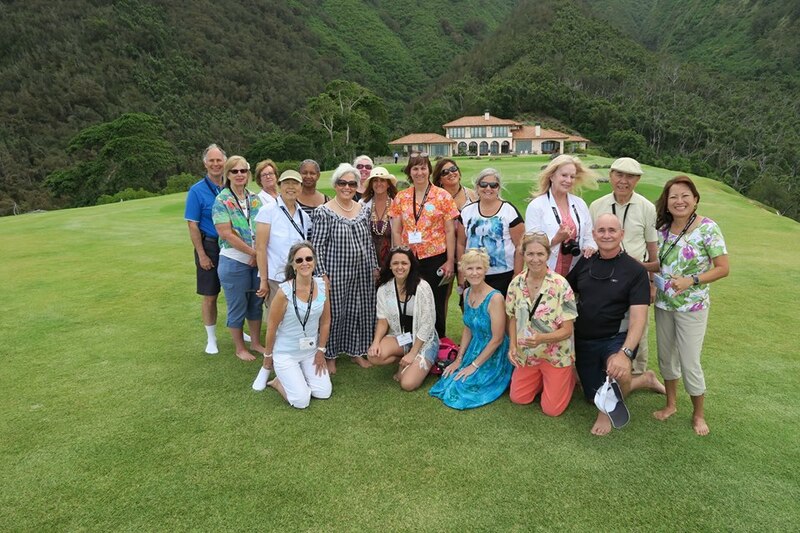 This is the perfect diversion on Maui; a wedding or affinity group event- a great option! And if you see that girl who is not terribly excited, please be kind. She is doing her level best to fit in with people who have an artistic bone in their body. 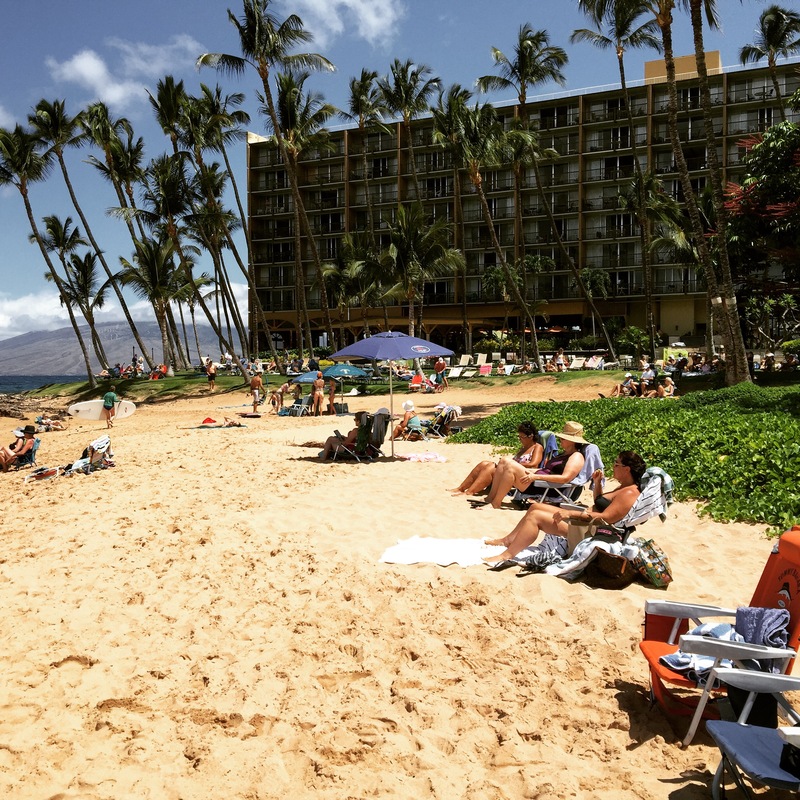 Mana Kai Maui from the beach is just as special as from the lanai. Bay of Banderas. I thought I was jaded. I was wrong and I am instead sated, deliciously satisfied not only as I look out, but as I look in. Yes, that is my view from my lanai at the Mana Kai Maui, otherwise known to me as heaven. Yes, you can see turtles in the water and sleep with the doors open. No, I did not want to leave. The condo has a king bed, granite countertops in a full kitchen (hooray for Hawaiian morning coffee on the lanai!) and a nice sized bathroom. But the view, no words. Dinner approaches, it’s here on site and with this view as the entrée, I’m eager to see how the dining is. I know I have found heaven up here, but what’s in that kitchen? Tiger Prawns and Scallops, couldn’t eat it all so had the remainder for lunch the following day. Excellent cuisine! 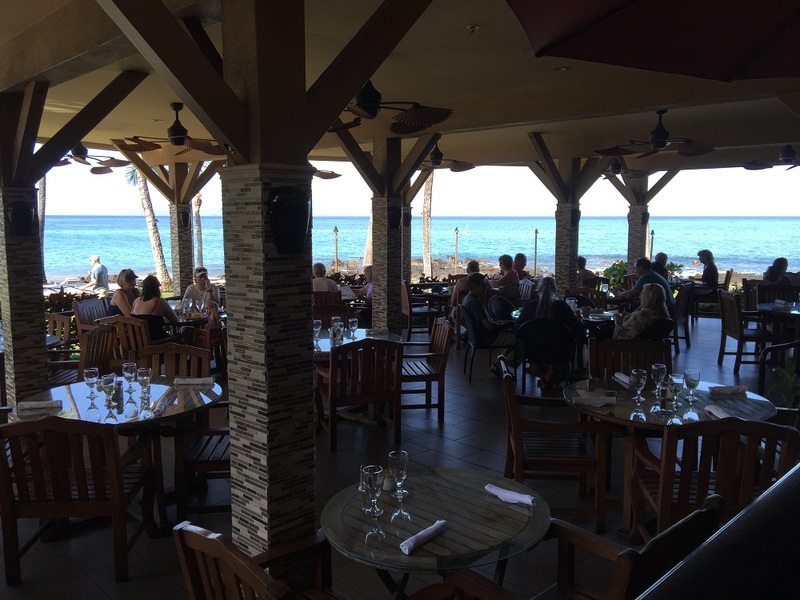 Everyone is enjoying ocean front dining at the splendid Five Palms in Kihei. obviously on top of things when I see what I’m served. First course, a great romaine’s heart salad. Second course, amazing tiger prawns and scallops over pasta. Third course? Their signature Pineapple Creme Brulee, smoking hot custard blazing on a pineapple slice. Yippeee! Heaven continues! Honestly, nowhere, no way has the Maui dream leaned closer to reality for me. This is it and I’m perfectly content to stay here from now on. Why leave? Mana Kai Maui, I love you so much it is a little pathetic. I can’t help it though, I just can’t. I fall asleep, lanai doors wide open, a murmur of aloha waves washing me into slumber. Heaven. 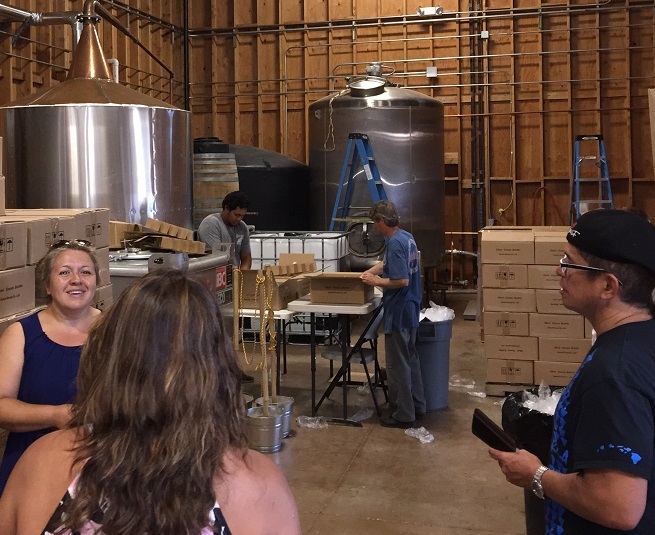 This shows one of the production areas at Ocean Vodka. Everyone is on their feet! 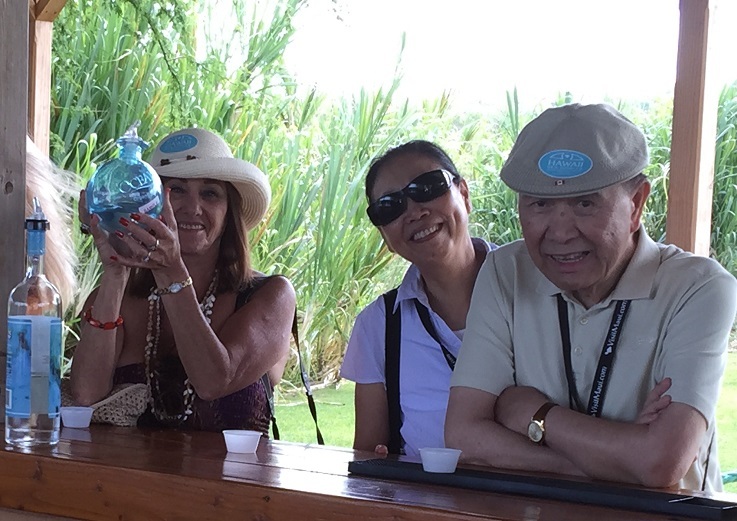 Travel Agents Mikki Fillhour, Steven and Louisa Wong do some early morning tippling at Ocean Vodka! Friday morning. It is a real treat to see a smallish family run operation that is so successful. How successful? So successful that wherever we go afterward, my friend Mikki tries to order it or buy it and it is ‘out’. 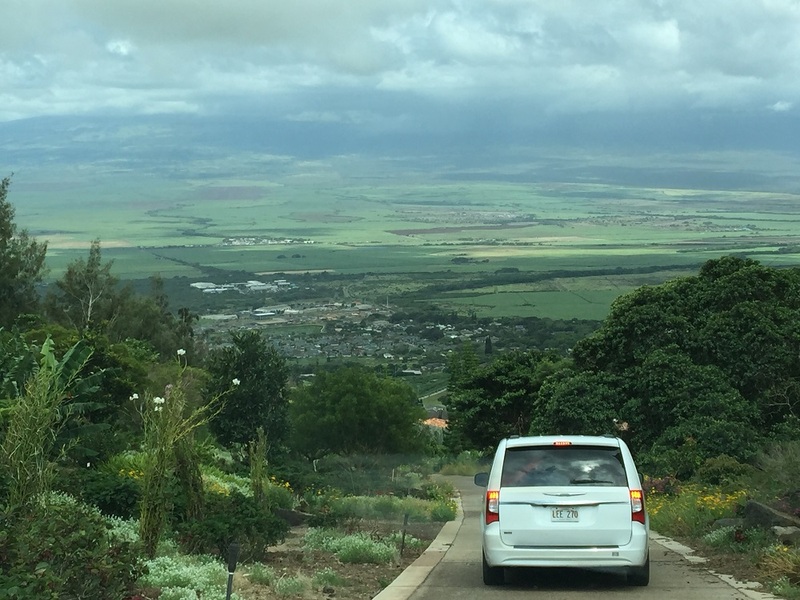 Huge demand for this uniquely Maui product and there’s also an open field area for concerts, wedding receptions, etc. It overlooks a valley with views to the ocean. Add a small store and you have the perfect business model. 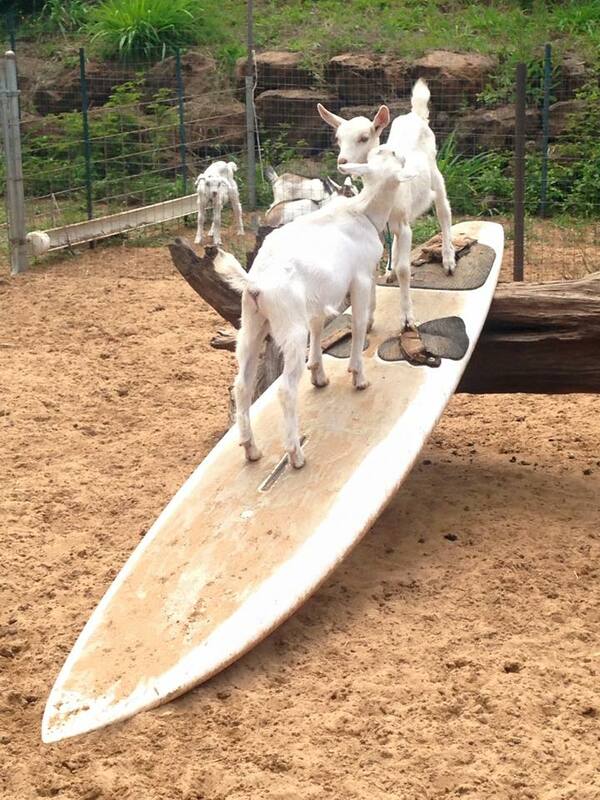 Susie Adair captured this great shot of surfing goats while visiting the dairy! they started, they ran into a guy at the dump getting rid of his boards. In a light bulb moment, they offered to repurpose them and now, the goats play yards are full of them. Surf board fences line the visitors area, very unique! I sample a variety of goat cheese and they’re all so good! My favorite is the Garden Fantasia, peppered with savory bits of organic veggies. Yum. Instructions on how to eat goat cheese on crackers came in handy for the taste testing! while offering the unique and tasty. Farm to table starts at these elevations. While on Maui, get off the beach for a day and head up to the cool country where a lot is happening, most of it sustainable and organic! Our group assembles on the vast lawn of Lona Ridge. Another Maui heaven spot, the view takes in two Maui coasts. Picture courtesy of Ken Kimi. 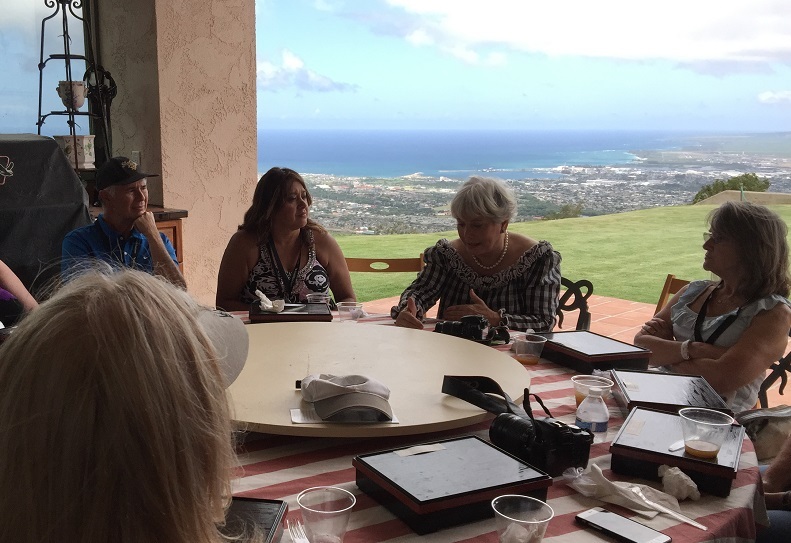 The lanai was the perfect spot for Leona Rocha Wilson to share stories about her life and the ongoing projects at Lona Ridge. mother knew she couldn’t pay for college, so encouraged Leona to enlist in the military which she did. Setting her sights high, she used the GI Bill to launch a career in the fashion industry. Today, she opens her home by appointment only (or the customary Monday farm lunch- see linked article for details), preferably to local school children. She has a keen desire to inspire the keiki to reach for their dreams. 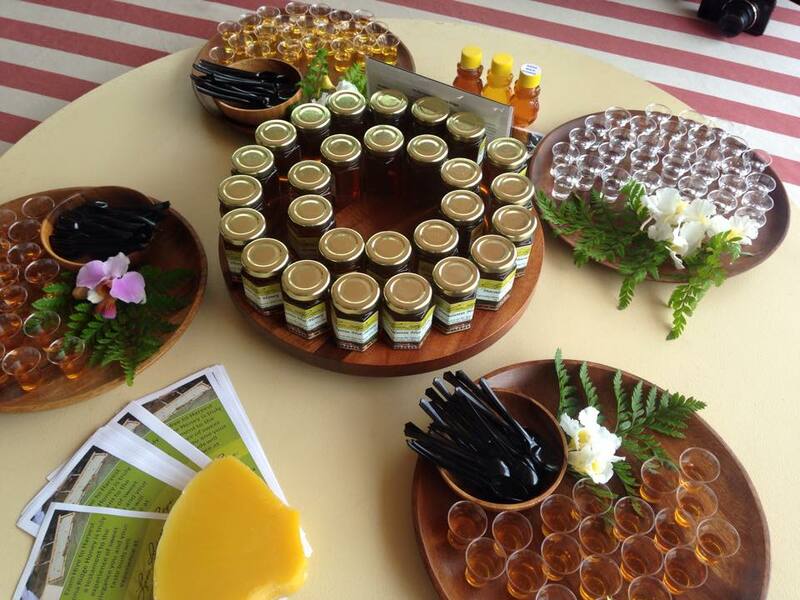 It is a true ‘island girl made good’ story and after she shares it, I sample honey. Honey sampling is the best! Photo courtesy of Susie Adair. 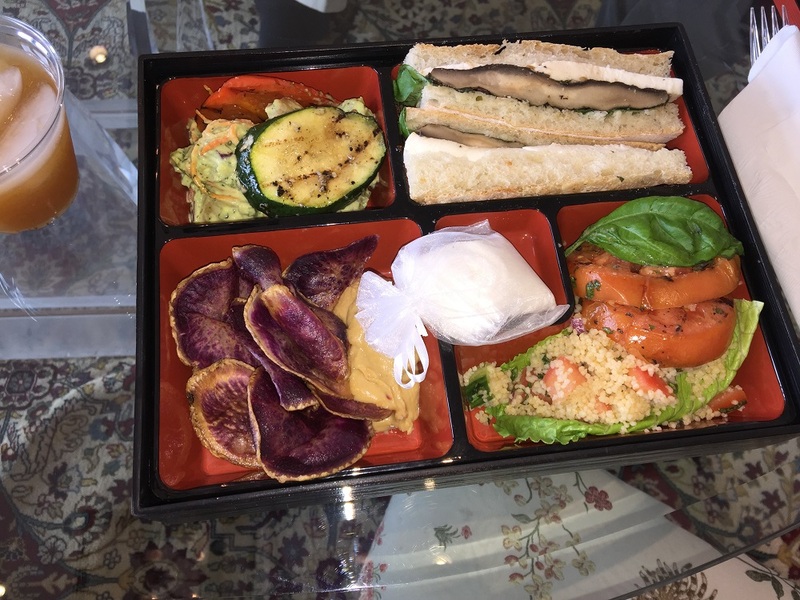 Portabella and fresh mozzarella cheese on a ciabatta roll, purple yam chips with hummus, grilled veggies and delectable couscous were topped off with tea made from Lona Ridge fruit trees. This food tasted better than it looks if that is even possible! The steep ride back down gave everyone the chance to just settle in and enjoy the view. It wouldn’t have been good if we would have had to move at all. Too full! a long time before they experience something that special again. What a treat. Pledging unending aloha overlooking the ocean at Mana Kai Maui. Oh my, warms the heart Hawaiian style! lot of restrictions about that were in place. 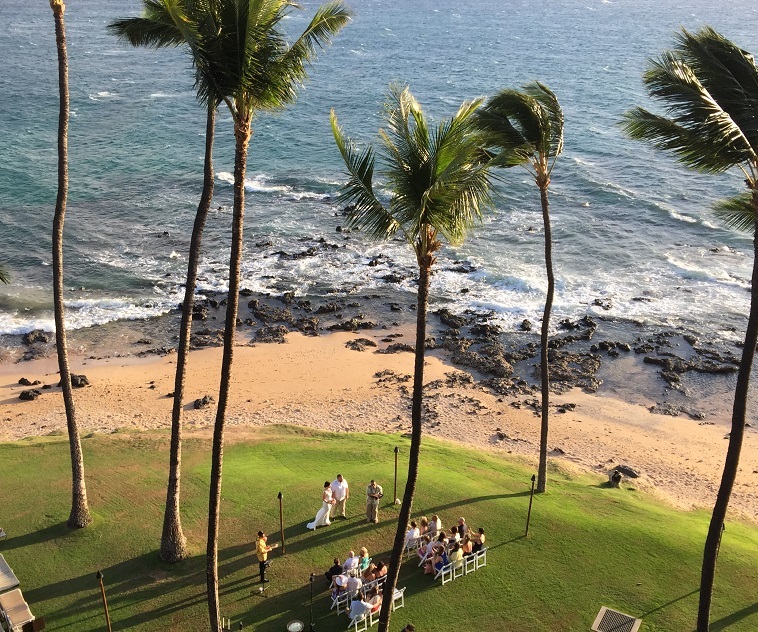 The setting is perfect for an ocean front wedding and this evening, the staff is preparing for one with delight. 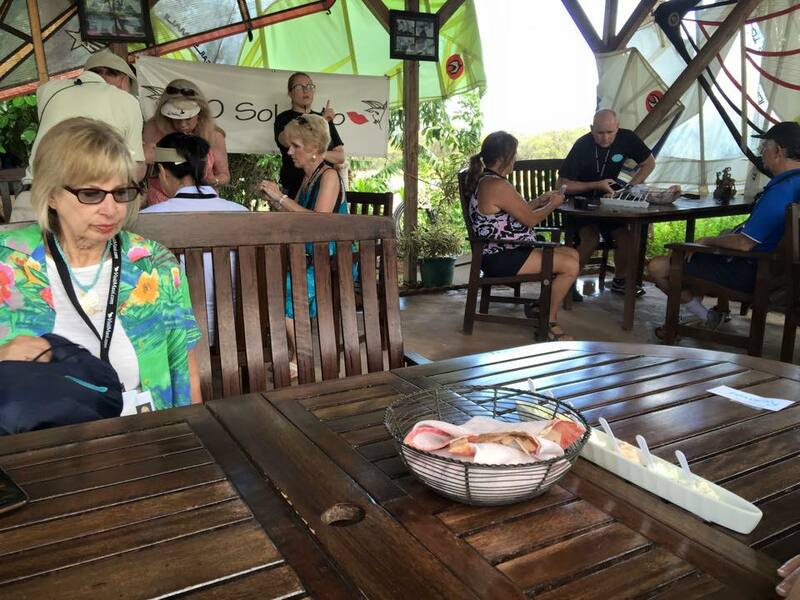 I see leis and a ukulele and neat rows of chairs. The sunset will frame the vows with the promise of enduring aloha. Mile high oh my chocolate pie! And with swimsuit day the next day, oh boy. an upscale strip mall in Wailea. 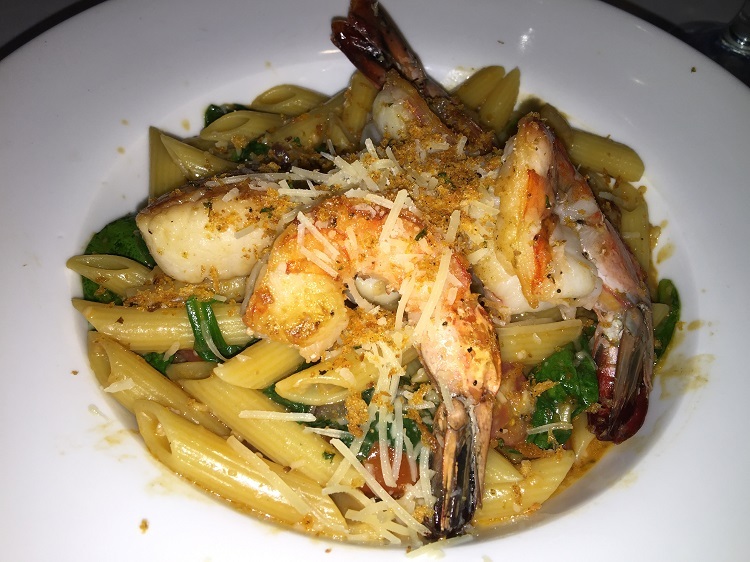 The place is jam-packed crowded and when our appetizers come out, I can see why. Seared poke’ tacos and garlic oil fries. Everyone had a choice for dinner and I chose the Kale and Wild Mushroom Gnocchi. 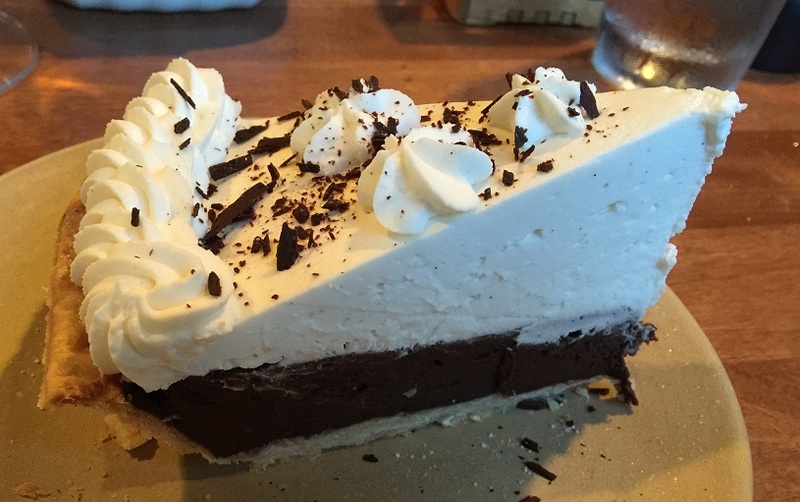 But the dessert, the Chocolate Cream Pie? It is a mile high! Piled high with delicious cream! I keep thinking as I attempt to polish it off, swimsuit tomorrow, with everyone. Oh boy. I’m not a quitter. I manage to eat almost all of it. motley crew, my fellow travel agents and the general public. Guys are speaking softly to calm their wives, others are trying hard not to stare at the hard bodies of the Hawaii styled bikini body guides and some of the kids can’t resist putting their flippers on to walk like ducks. We arrive. There is abundant sea life in this extinct volcanic crater. “Don’t get too close in to the crater walls because that pretty coral is sharp and dangerous” we’re warned. I wait my turn and take the plunge. Snorkeling has never been fun for me, a glasses wearer. The prescription lenses change everything. 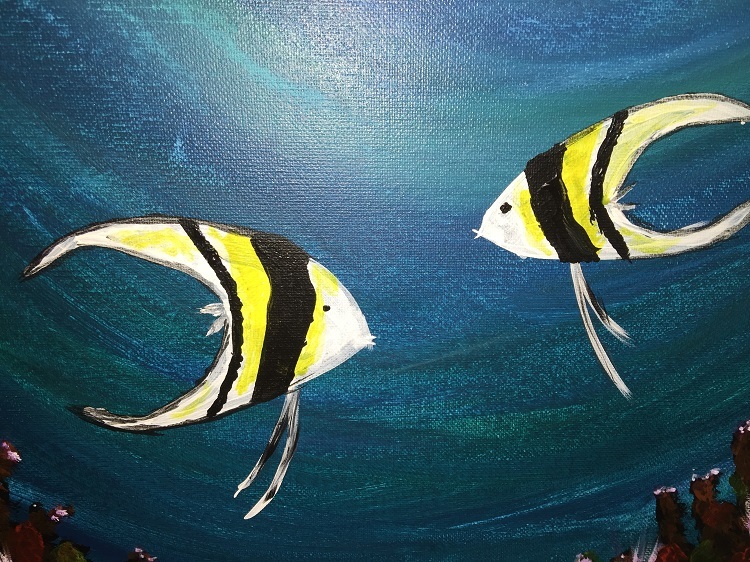 I can see the pretty fish and the beautiful coral! I am so mesmerized, floating and staring down in awe that one of the guides swims to me to ask me if I’m alright. Well yes, you see, I am staring at the bottom of the ocean, the beauty of it. Duh. Everyone else is flipping and flopping but I am happy to turtle around slowly, just taking it all in and remembering to breathe through my mouth, not my nose. It works. I am happy and at peace staring at the ocean floor, the coral and the fish. I am one of the last few on the boat because next, turtle town! On the way? Rum punch and sandwiches. Yea! 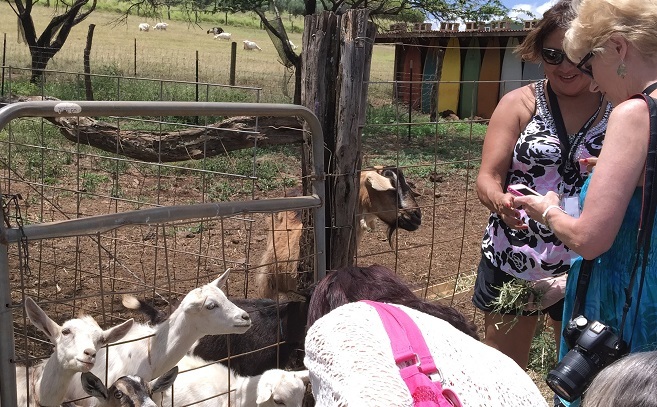 Monica Ambriz and Susie Adair discuss best practices for feeding Hawaiian goats. territory, alone, with that damn shiny ring I forgot to take off, just asking to get bit or worse. Before I was all “I love honu’ and now I’m all “I am shark bait!” so honestly, I start to panic a little. I soon realize that swimming faster will not make the shark any slower and will wear me out. I calm myself, swim purposefully and wish I knew a song about honu to replace the Jaws theme. Hasn’t Jack Johnson written a honu song? Ugh. I pass a guy who is consoling his wife as they schlep through the waves. I don’t think anyone thought it would be such a far swim and expecting this, the staff is throwing out ropes to pull people in? Why not just move a tad closer? Anyway, I’m glad to be back on board after surviving the Jaws encounter in my head. I look resentfully at my sparkly ring as we head back to shore. 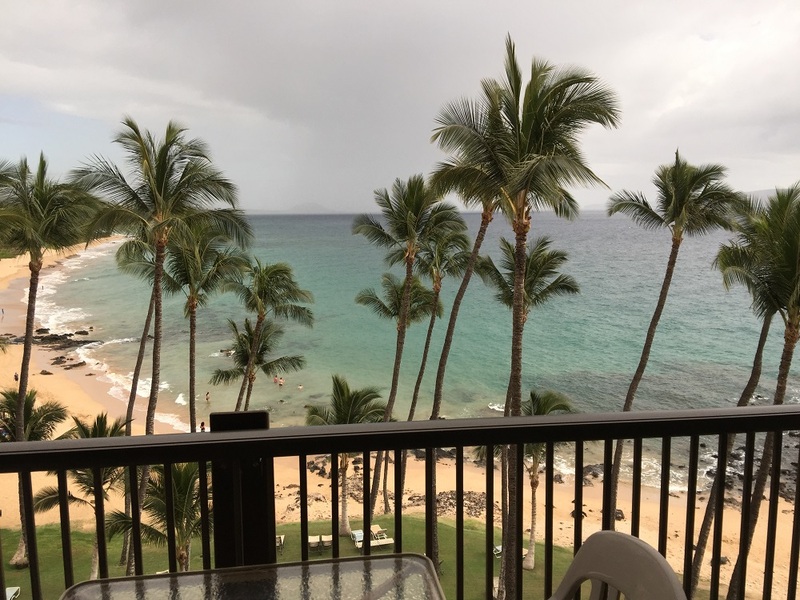 This is your view at breakfast if you’re lucky enough or smart enough to book a room at the Mana Kai Maui. and discover the secrets of Molokai and Lanai. But on any of these islands? Don’t limit yourself to the beach. I know, I know, all I’ve been showing are videos of the beach. This last one is on Molokai, three miles of pristine beauty, deserted. Papohaku Beach. Worth thr trip, but again, off the beaten path. So many activities and interesting things to discover await you. Venture off the beaten path for that unique experience. You’ll be glad you did and the people you meet? They’ll also be happy you branched out to find the gems of aloha, scattered about just waiting to be enjoyed. Mahalo Maui Nui. 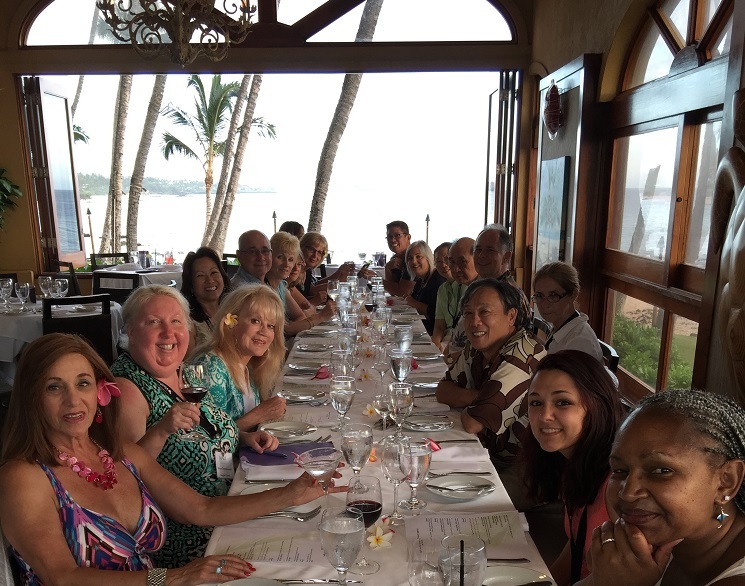 Many thanks to the organizers of this trip, ASTA, NACTA, and the Maui Nui Visitor and Conventions Bureaus. Very well done and executed. Mahalo! Type of travel- couple, friends, family, multigenerational? Tulips, Faux Arrest and BICYCLES! Dreams of travel becoming real, travel take me.